Exquisite. Rare form: burr clusters have crystals all the way around. Fabulous clarity. Devic and white titanium veils. Many crystals doubly-, multi-terminated. More than several crystals with uncommon 7h faces. Step faces [rare], extra prism faces. Rainbows, record keepers, a stand of points. 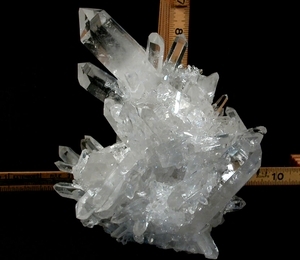 Largest individuals: a 1-1/4x 4" tabular crystal; a many-penetrated top crystal, 1-1/4x 3-3/4" with a slight curve; a rare, rare dogtooth doubly-terminated and also many-penetrated crystal, 1-1/8x 4-3/8. Singly, loose, these three crystals might be 'enough'...combined into this extravaganza they are simply amazing foils for all the other crystals. 3 small chips, 2 points which left the family, and 1 graze hardly count against the slim chance of a burr cluster - and of this high quality - even forming, let alone surviving harvest. Overall 7" wide x 6-1/4" deep x 7" high. O-and a 1/2x 1-1/2" scepter, twinned and doubly-terminated penetrates the lead point. We have a few extra pictures if you require. Sent doubly boxed with handwritten description. Shipping will be added.